Sony: A Private Life ReviewWhile this is ostensibly a book about business (it is categorized as such), it is really a book about people and the complex personal and social relationships that were a part of Sony's rise from an unknown engineering company born out of the rubble of post WWII Japan to one of the largest and well recognized companies in the world. 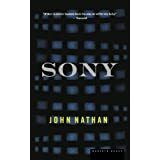 Mr. Nathan does a remarkable job of providing the reader with a palpable feel for the personalities intimately involved in the Sony story, particularly those of the Japanese leaders who drove the birth and growth of Sony as a global power. This is something that is all too rare in business texts on Japanese corporations and makes the insights provided by this book all the more valuable. By the story's end we feel almost as though we know personally Masaru Ibuka, Akio Morita, and Norio Ohga, the men who lived and made Sony. What we come to realize is that in Japan, contrary to initial appearances, business is driven by social and personal considerations as least as much, if not moreso, than business considerations. Want to learn more information about Sony: A Private Life?